I love my Kindle... but it doesn't replace the wonder of a good book cover. I believe until it has a full on colour screen, kind of like the iPad but one that is comfortable to read on for long periods, there is still a competitive advantage in an awesome cover that enhances the 'artefact' element. Recently I have started to seriously collect J.R.R Tolkien memorabilia... especially copies of 'The Hobbit'. I have a number of copies on my bookshelf and would love a whole shelf devoted to the various editions that have appeared since the first one in 1937. 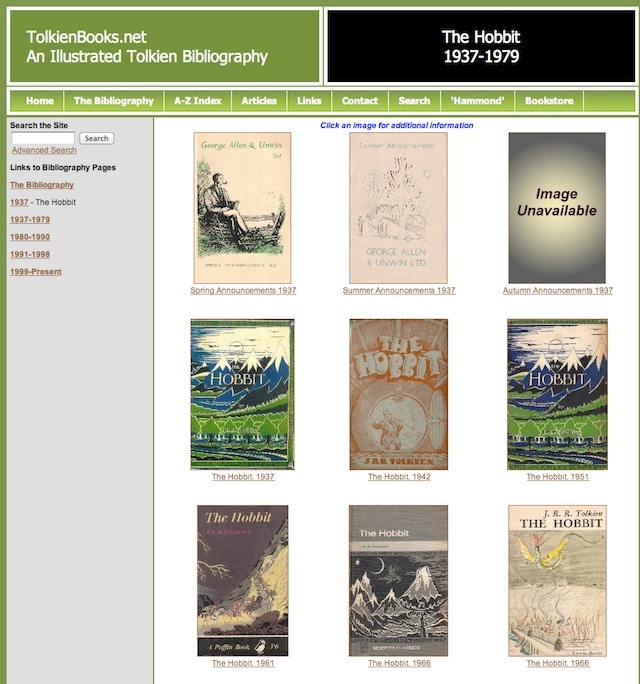 I have found Tolkienbooks.net to be a valuable resource for my obsession... they have a picture of most (but not all) of the releases... from Unwin and from Harper Collins. This is why I love the internet... that there are folks out there who have expended the time and effort compiling and presenting collections on the most obscure of things for folks like me... and those who come after me. Maybe I'm getting older... but I find that comforting. This highlights a downside of the Kindle and, to be honest, digital media - once you have a copy... you don't need to buy it again. There can be no collecting... because apart from the quality of the medium itself, there isn't anything unique about a specific release... unlike a book with its different covers. Maybe this is a good thing. I only *need* one copy of 'the Hobbit'... but with the artwork on offer... I guess I *want* more than one. It's good to collect something... if only to feed the inner nerd... and I'm glad there are resources out there to help me. If you have a copy of 'the Hobbit' that you don't want... and I don't happen to have the version you have... I'll take it off your hands.